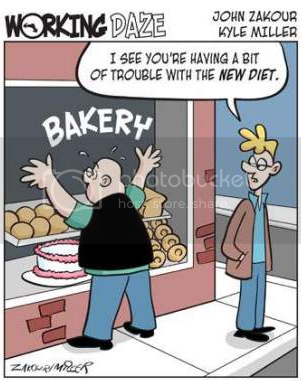 No one can stay on a diet indefinitely because it is not natural. It is an artificial way of living that can be adopted and adhered to temporarily, but must come to an end. When it does — as it inevitably will — and you revert to the old ways of eating and relating to food which were familiar to you for so long before you began the temporary program, all of the weight lost will be regained. And more. Because your body will protect itself instinctively from any repeat onslaught of starvation such as the one it just survived. I’m not a nutritionist, but I have read a great deal of literature about this. More importantly, I have lived out the cycle numerous times over the years. My understanding: Scientific evidence proves that diets slow down your metabolism. When you drastically reduce the number of calories you consume, for instance, your body panics and starts storing up fat like a squirrel hiding its stash for the long winter. Sure, you lose pounds. You also lose lean muscle mass which is precisely the opposite of what you want to accomplish. Then the diet ends, the body realizes that food delivery in generous portions has resumed, but suspects that it may again become scarce. Better store the new stuff as fat just in case there is another drought, it tells itself. So the result is short-term success followed by the disappointment and despair of not only gaining it all back, but surpassing your previous highest weight and size. And when people notice my weight loss and ask “Are you dieting?” or “Oh, which diet are you on?” my response is always “No” and “None. I’ve changed the way I eat and work out regularly.” In most instances — unless the person who posed the question is genuinely interested — the subject is dropped and the conversation progresses to more salient topics like whether or not Lindsay Lohan can straighten up and Letterman’s latest jokes about her. Amen and AMEN! Most of the time people tell me “You are looking great! What are you doing?” and I’m able to say “I’ve changed my eating habits and am getting regular exercise.” It’s definitely a change of lifestyle, not a fad diet. I feel like the person in the cartoon today. That is so funny… I read your blog and my instant reaction was to say “AMEN”!! And then I see the first comment. I just want to reiterate it again… AMEN, AMEN, AMEN!! Amen, I totally agree sweet one. Thanks for stopping by! Glad you enjoyed your visit and hope you will return. We have to support each other in our lifestyle change, right? Maggie: We all have days like that! I certainly do. But I keep telling myself that it won’t be worth it to go back. First of all, if I ate that kind of food again, I would be physically ill. So that’s a great deterrent. More importantly, my asthma is so dramatically improved, I can’t imagine going back to not being able to breathe. I was utterly miserable and found myself in my doctor’s office saying — this is verbatim — “I can’t live like this. You have to do something.” The reality was that I had to do it for myself. Email me or contact me on Facebook (JHSEsq) or AIM (jhsiess) if you want a buddy to help you through a tough day! I love this post! You are so right, and it is great to have blogs like this to read for encouragement! Have a great night! That is why I like the program that I’ve started. There are so many times that it talks about lifestyle changes instead of diets. And it is so clear about why things like excessive salt, sugar, and oil are bad. It helps me to understand why I need to stay away from those things. Thanks for sharing your insight.